Canadian singer and songwriter Royal Wood, who plays Market Hall December 8th, was in town recently and PTBOCanada had a chance to sit down with him for an interview. PTBOCanada: You mentioned in a tweet last year that you were beginning the recording of We Were Born to Glory in Montreal. The studio looked beautiful and we wanted a sense of why you chose that location. Royal: For this record, I used Pierre Marchand's studio, and Pierre had produced three of the songs on The Waiting, so I had already used that studio before. Pascal Shefteshy, the engineer there (who was nominated for a Grammy) is super talented, and with Dean (my guitar player) produced it and it worked out perfectly. I had written We Were Born to Glory in Montreal, and I wanted to record it there. The energy and vibe of the city really lent itself to what I was trying to make. There is nothing lacking in that studio. Any gear you can think of is there and waiting. Pierre spared zero expense building that place. It's the dream. I was a kid in a candy store every day. PTBOCanada: We remember when you played at the Gordon Best Theatre in Peterborough. You hammered away on their old piano and it sounded fantastic. Did you have a favourite piano while recording the new album? Royal: We had a few choices. Pianos are individuals to me. You can have the same series of piano and it will be completely different depending on which on you have. They all have ghosts for some reason. I love trying to find the right piano for the right song and Pierre definitely had a lot to choose from. There was an old upright Steinway from the early 1920s that we used for things that we wanted more of a "rock" type feel. He also has a beautiful C-Series Yamaha, and an Italian hand made Fazioli worth half a million dollars which is like driving a Ferrari. I will always try and play a real piano first and foremost because it is different. A real piano is percussive. You can really hammer in on it and get a different sound and there isn't yet to be a keyboard that has ever come close to sounding—and feeling—like a piano. You don't feel the resonance from the strings, you don't feel the attack; certain notes will give more than others. Some can have a quirk, such as a note that wants to stick a bit, but there is something unique about it. You would miss it if you were playing a keyboard because it just doesn't feel the same. PTBOCanada: "I Want Your Love" was Number One on CBC Radio 2's Top 20 for 14 weeks. When you were writing it, did you think it was going to be a hit? Royal: Yeah, I had a good run there. No, when I write anything, it comes from some place. You pull it out of the ether and I was left with a song. PTBOCanada: Do you think that is why it has done so well? Royal: There is a definite human emotion there... it's lust. It's what every person feels from the time puberty kicks in. It also has a melody that is memorable. I was raised on the Beatles, so melody first, and it has a good hook. PTBOCanada: Randy Bachman spoke to that... saying that he writes a song around a hook. Royal: It's not like you're trying to craft the perfect little pop song, but there will be something as you are writing it that you are so drawn to, to keep repeating. That tends to be the chorus. I think it was John Lennon who said that a song should be two choruses, and your verse should be just as strong as the chorus is—which means you are just writing two choruses. I never want it to be just a writing exercise. If I'm still drawn to it by the time I reach the studio, then the song makes it. I wrote upwards of 50 songs for this record and a lot ended up not being album worthy. PTBOCanada: Tell us more about filming your latest video for "I Want Your Love" in Mexico. You mentioned before that you filmed "Do You Recall" in Iceland because you wanted it to look different. Royal: I had a very tall order for "Do You Recall", and for this one I wanted a location that was unique to anything that had been shot before in Canada. I find a lot of our videos look the same because we're all going to the East coast, standing by the railroad tracks, by an abandoned car or in an empty warehouse. By no means am I demeaning that because I'm sure one day that I'll have that moment in a warehouse in a video. I'm trying to do something new for myself, that I would get excited by. We tossed around a lot of ideas and locations and my director (Jeth Weinrich), who actually did the "Do You Recall" video as well, said that he had a lot of friends in the filming community in Todos Santos, Mexico. We were able to hire people without flying them in and Jeff flew down a week in advance, scouted locations and brought back all of these stills. The shoot was amazing. PTBOCanada: This year, you performed at the Owen Sound Summerfolk and the Ottawa Bluesfest. Do you feel that your music spans all genres? Royal: I definitely can be a chameleon. When I'm at a folk fest I like to lean towards my acoustic guitar, as there are a lot of folk songs I know and I can be the storyteller. I also love to rock with the band, have the five piece and play louder songs while really pushing my voice. It's all genuine, and I'm not trying to placate or pander to anyone. It's what I'm inspired to do in the moment. When I'm at a folkfest doing a song circle, and everyone has their acoustic guitar including me, that suddenly becomes the exciting thing to do. It's to tell a story and go park in the days of really great folk music. The Dylans of this world and Leonard Cohen. I was raised on all sorts of music and it all excites me. Classical excites me as much as Jazz. I'm just a kid who has a lot of colours and wants to paint. PTBOCanada: How was performing with the Niagara Symphony? Was there a lot of preparation? Royal: Well no, I've had strings on every record and I have always done my own arrangements for strings and horns. Nothing had to be done, other than changing some parts for the band to make it more friendly for that large of a strings section. We went through half of each song to make sure the markers were there with the conductor. Him and I worked on queues because some of the songs might have something like a pizzicato at the end that has to be emphasized. Although it is written, I myself wanted to tell the conductor "really exaggerate this" or "really slow this down". Playing with the Niagara Symphony was a career highlight. I was just offered a chance to play in the Netherlands with their 85 piece orchestra and there will be others coming. It is a pretty incredible way to play. My wife [singer/songwriter Sarah Slean] has played with string players since the beginning and she was born to arrange for strings. PTBOCanada: Any future collaboration with Sarah? Royal: Not from a writing perspective. Maybe touring one day. We follow our own muse and have our own art and I think that is healthy. I think that is the only way to be an artist. Otherwise, I think you are just an entertainer. I think that was the attraction for the both of us. We get how personal your artform is and how it is answering some other call. 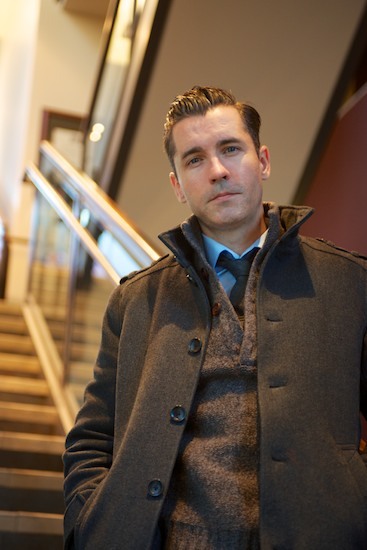 Royal Wood is playing at Market Hall on December 8th.